Disaster was quickly averted on Wednesday night, the third day of Felabration 2018, at the VIP/Artiste lounge of the New Afrikan Shrine, when Seun Kuti lost his temper over a staff of the Shrine who disrespected him. Seun who arrived at the Shrine in the company of a few associates was all shades of good mood but lost his cool when a security guard who later told Showtime that he didn't recognize Seun, attempted to walk him out because the lounge was strictly for VIPs and artistes. Obviously shocked that a security guard at the Shrine would treat him like a regular person, Seun angrily slapped and bullied the helpless security guard who was quick to apologize for his mistake. 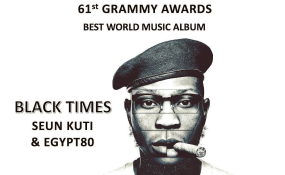 "Honestly I did not know that it was Seun Kuti because I do not recognize him. I was only trying to do my job by asking blocking him from entering. I didn't mean to disrespect him or cause a scene out of my actions."